Many people think that Henry Ford invented the automobile and the assembly line, but that is not correct. He did change the world by using the assembly line to manufacture cars and put America on wheels. From 1909 until 1927, Ford turned out the Model T. The 1927 Model T gave way finally, to the Model A. However, from its beginning to end, more than 15 million Model T cars were made. Henry Ford almost singlehandly transformed America’s social and economic outlook in the 20th Century. The 1927 Model T represented a basic formula for success. It was a simple and durable car that was turned out of the factory more economically than another other vehicle of the time, because of Ford’s use of the assembly line. The Model T while made on the cheap, was not cheaply made. For instance, the engine was cast en bloc, whereas other car makers made one cylinder at a time and put them together. Ford also came up with the removable cylinder head. Many feared incorrectly that the cylinder would leak, but that was not the case. 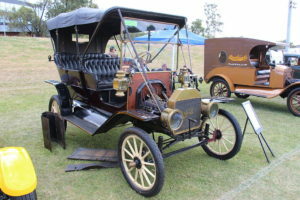 Model T initially cost $825 when made in 1909. But by 1927 the price of a brand new Model T was down to $260. The reason for this was that as more cars were made, the price was dropped. By 1913 the Ford company could put together a car in 93 minutes, and sold 200,000 vehicles. Top speed for the 1927 Model T was between 35 to 40 miles per hours, which was pretty good considering that the paved road was still off in the future. Engine cooling was very primitive as was lubrication. The gas tank was situated under the front seat with fuel fed to the engine by gravity. Foot pedals were used to operate the two speed transmission. Rims became available for $25 in 1919. Ford’s better idea took his company from making 10,000 cars per year in 1908 to 2 million cars just 15 years later. Ford was outproducing all of the other American car makers put together.